We require all guests register and submit a valid credit card number to reserve your day. We've recently switched over to a new system called Pike13. When you click the link above, you will either login to an exisiting profile (if you have climbed with us in the past, please try logging in with the email address you had when you reigstered last time), or create a new profile. We accept cash, checks, credit cards, and Pay Pal for deposit and/or final payment. Our rates include all the necessary technical climbing equipment and daily passes required. You only need to bring lunch, water and adequate clothing suitable for the time of year. Please visit our Gear Lists section for a gear list applicable to your day. Rates do not include transportation, meals, or gratuities - unless specifically stated. All parties will have their own private guide for each day. We will not pair you up with unknown guests unless it is an openly scheduled event, or you request it and it is acceptable by them. Rates do not include transportation, meals, or gratuities. Introduce a Child to Climbing! Any adult who is scheduled to climb can bring a child (4 to 12 years old) with them for only $35. Restricted to one kids specialty program per day and limited to single pitch only for a party size of no more than 2 adults and 2 kids - program does not apply to group programs. If your party will consist of more than 2 adults and 2 kids, regular rates apply. This program is not permitted to guests rock climbing at Mohonk or Mohonk Preserve, or areas other than Peter's Kill at Minnewaska State Park. If you want to climb on the Preserve, there is an additional $10 fee (single pitch only). If you would like to do multi-pitch, rates are based on our regular per person rate. * Any climber with a current Mohonk Preserve annual climbing membership will receive a $17 discount for each day of climbing on the Mohonk Preserve. For larger groups interested in climbing, we provide all the technical equipment, daily park passes, and maintain low climber/guide ratios. 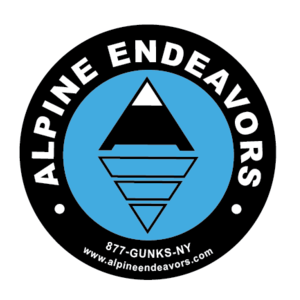 IE - A long day in the Gunks climbing one route at each of the different cliffs in the area (Near Trapps, Millbrook, Peterskill, Lost City, and the Trapps) with the average hiking distance is approximately 11 miles. Another example would be a day to Wallface in the Adirondacks, etc. Marathon days are limited to a maximum of two people, with previous climbing experience required. If you are planning on coming out for a few days for skill instruction or guiding, take advantage of discounted rates with our Frequent Climber Card. You'll not only learn the skills you need, but also have a yearly climbing membership for the Mohonk Preserve for more return trips that year. If you are looking for a special gift, we also offer Gift Certificates in any denomination or trip length so you can give the gift of climbing. Our cancellation policy requires notification at least 7 days prior to your day for rescheduling or at least 14 days prior to your day for a refund. Please view our CANCELLATION POLICY in detail. We now offer adventure travel insurance to all our guests for all of our multi-day trips. This new insurance is provided through Travel Guard and will cover you not only while you are traveling, but also when you are out climbing in the mountains. It is highly recommend for all of our multi-day trips.